This tool produces an output feature class with the fields used in the analysis plus a new integer field named CLUSTER_ID. Default rendering is based on the CLUSTER_ID field and shows you which cluster each feature falls into. If you indicate that you want three clusters, for example, each record will contain a 1, 2, or 3 for the CLUSTER_ID field. Input can be points or polygons. This tool also creates messages and charts to help you understand the characteristics of the clusters identified. You may access the messages by hovering over the progress bar, clicking on the pop-out button, or expanding the messages section in the Geoprocessing pane. You may also access the messages for a previous run of the Spatially Constrained Multivariate Clustering tool via the Geoprocessing history. The charts created can be accessed by selecting the List By Charts tab in the Contents pane. The Analysis Fields should be numeric and should contain a variety of values. Fields with no variation (that is, the same value for every record) will be dropped from the analysis but will be included in the Output Features. Categorical fields may be used with the tool if they are represented as dummy variables (a value of one for all features in a category and zeros for all other features). The Spatially Constrained Multivariate Clustering tool will construct clusters with space (and potentially time constraints, when using a spatial weights matrix). For some applications you may not want to impose contiguity or other proximity requirements on the clusters created. In those cases, you would use the Multivariate Clustering tool to create clusters with no spatial constraint. The size of the clusters can be managed with the Cluster Size Constraints parameter. You may choose to set minimum or maximum thresholds that each cluster must meet. The size constraints can be either the Number of Features that each cluster contains or the sum of an Attribute Value. For example, if you were clustering US counties based on a set of economic variables, you could specify that each cluster has a minimum population of 5 million and a maximum population of 25 million. When a Maximum per Cluster constraint is specified, the algorithm starts with a single cluster and will split clusters and solve until each of the clusters are below the Maximum per Cluster value, taking into account all of the variables with each split. The splitting will stop once the constraint is met, even if splitting existing clusters further may provide a better result. If both a maximum and minimum are set to values close to each other, the Cluster Size Constraints for one of the resulting clusters may not be met. Occasionally, the Cluster Size Constraints may not be honored for all clusters due the way the minimum spanning tree is constructed. The tool will finish and the cluster that did not meet the size constraints will be reported in the messages. This tool creates clusters that are spatially contiguous. The contiguity options enabled for polygon feature classes indicate features can only be part of the same cluster if they share an edge (Contiguity edges only) or if they share either an edge or a vertex (Contiguity edges corners) with another member of the cluster. The Trimmed Delaunay triangulation option ensures outlier or island features can be clustered and may form disconnected clusters. The default Spatial Constraints for point Input Features is Trimmed Delaunay triangulation which will ensure all cluster members are proximal and that a feature will only be included in a cluster if at least one other feature is a natural neighbor. This method uses Delaunay triangulation to find point neighbors then crops the triangles with a convex hull. This ensures point features cannot be neighbors with any features outside of the convex hull. The Trimmed Delaunay triangulation method ensures that neighboring features are in close proximity to each other. If there are spatial outliers in your data, this method may have little effect as the Delaunay triangles extend so far out that the convex hull trimming has little effect on features that may not be in close proximity without the spatial outliers. Additional Spatial Constraints, such as fixed distance or K nearest neighbors, may be imposed by using the Generate Spatial Weights Matrix tool to first create an SWM file and then providing the path to that file for the Spatial Weights Matrix File parameter. Even though you may create a spatial weights matrix (SWM) file to define spatial constraints, there is no actual weighting being applied. The relationships become binary when defining spatial constraints within the clustering algorithm, even if a method such as Inverse Distance is used. If Inverse Distance is used without a distance cutoff, this will result in a SWM that defines features based on weights, but the clustering algorithm ignores those weights, and defines every feature as a neighbor of every other feature. This can impact performance and will lead to groups that are not truly spatially constrained. Similarly, choosing a K nearest neighbors conceptualization can result in clusters that are spatially constrained, but not necessarily contiguous. In order to create clusters with both space and time constraints, use the Generate Spatial Weights Matrix tool to first create a spatial weights matrix file (.swm) defining the space-time relationships among your features. Next run, the Spatially Constrained Multivariate Clustering tool, setting the Spatial Constraints parameter to Get spatial weights from file and the Spatial Weights Matrix File parameter to the SWM file you created. In order to create three-dimensional clusters that take into consideration the z-values of your features, use the Generate Spatial Weights Matrix tool with the Use Z values parameter checked on to first create a spatial weights matrix file (.swm) defining the 3D relationships among your features. Next, run Spatially Constrained Multivariate Clustering, setting the Spatial Constraints parameter to Get spatial weights from file and the Spatial Weights Matrix File parameter to the SWM file you created. This tool is memory dependent. When using a Spatial Weights Matrix, a Conceptualization of Spatial Relationships that results in each feature having a large number of neighbors will increase the likelihood of running into memory issues. Defining a spatial constraint ensures compact, contiguous, or proximal clusters. Including spatial variables in your list of Analysis Fields can also encourage these cluster attributes. Examples of spatial variables would be distance to freeway on-ramps, accessibility to job openings, proximity to shopping opportunities, measures of connectivity, and even coordinates (X, Y). Including variables representing time, day of the week, or temporal distance can encourage temporal compactness among cluster members. When there is a distinct spatial pattern to your features (an example would be three separate, spatially distinct clusters), it can complicate the spatially constrained clustering algorithm. Consequently, the clustering algorithm first determines if there are any disconnected clusters. If the number of disconnected clusters is larger than the Number of Clusters specified, the tool cannot solve and will fail with an appropriate error message. If the number of disconnected clusters is the same as the Number of Clusters specified, the spatial configuration of the features alone determines cluster results, as shown in (A) below. If the Number of Clusters specified is larger than the number of disconnected clusters, clustering begins with the disconnected clusters already determined. For example, if there are three disconnected clusters and the Number of Clusters specified is 4, one of the three clusters will be divided to create a fourth cluster, as shown in (B) below. In some cases, the Spatially Constrained Multivariate Clustering tool will not be able to meet the spatial constraints imposed, and features without neighbors will be the only feature in their cluster. Setting the Spatial Constraints parameter to use Trimmed Delaunay triangulation can help resolve issues with disconnected clusters. While there is a tendency to want to include as many Analysis Fields as possible, for this tool, it works best to start with a single variable and build. Results are much easier to interpret with fewer analysis fields. It is also easier to determine which variables are the best discriminators when there are fewer fields. Sometimes you know the Number of Clusters most appropriate for your data. In the case that you don't, however, you may have to try different numbers of clusters, noting which values provide the best group differentiation. When you leave the Number of Clusters parameter empty, the tool will evaluate the optimal number of clusters by computing a pseudo F-statistic for clustering solutions with 2 through 30 clusters and report the optimal number of clusters in the messages window. When you specify an optional Output Table for Evaluating Number of Clusters, a chart will be created showing the F-statistic values for solutions with 2 through 30 clusters. The largest F-statistic values indicate solutions that perform best at maximizing both within-cluster similarities and between-cluster differences. If no other criteria guide your choice for Number of Clusters, use a number associated with one of the largest pseudo F-statistic values. Regardless of the Number of Clusters you specify, the tool will stop if division into additional clusters becomes arbitrary. Suppose, for example, that your data consists of three spatially clustered polygons and a single analysis field. If all the features in a cluster have the same analysis field value, it becomes arbitrary how any one of the individual clusters is divided after three groups have been created. If you specify more than three clusters in this situation, the tool will still only create three clusters. As long as at least one of the analysis fields in a cluster has some variation of values, division into additional clusters can continue. Clusters will not be divided further if there is no variation in the analysis field values. When you include a spatial or space-time constraint in your analysis, the pseudo F-Statistics are comparable (as long as the Input Features and Analysis Fields don't change). Consequently, you can use the F-Statistic values to determine not only optimal Number of Clusters but also to help you make choices about the most effective Spatial Constraints option. The cluster number assigned to a set of features may change from one run to the next. For example, suppose you partition features into two clusters based on an income variable. The first time you run the analysis you might see the high income features labeled as cluster 2 and the low income features labeled as cluster 1; the second time you run the same analysis, the high income features might be labeled as cluster 1. You might also see that some of the middle income features switch cluster membership from one run to another. The Permutations to Calculate Membership Probabilities parameter uses permutations and evidence accumulation to calculate the probability of cluster membership for each feature. A high probability tells you that you can be confident the feature belongs in the cluster it was assigned. A low probability may indicate the feature is very different than the cluster it was assigned or that the feature could be included in a different cluster if the Analysis Fields, Cluster Size Constraints or Spatial Constraints were changed in some way. Calculating these probabilities uses permutations of random spanning trees and evidence accumulation. This can take significant time to run for larger datasets. It is recommended that you iterate and find the optimal number of clusters for your analysis first and then calculate probabilities for your analysis in a subsequent run. You can also increase performance by increasing the Parallel Processing Factor Environments Setting to 50. The feature class or feature layer for which you want to create clusters. The new output feature class created containing all features, the analysis fields specified, and a field indicating to which cluster each feature belongs. A list of fields you want to use to distinguish one cluster from another. Specifies cluster size based on number of features per group or a target attribute value per group. NONE —No cluster size constraints. This is the default. NUM_FEATURES —Set a minimum and/or maximum number of features per group. ATTRIBUTE_VALUE —Set a minimum and/or maximum attribute value per group. The attribute value to be summed per cluster. Specifies the minimum number of features per cluster or the minimum attribute value per cluster. Must be a positive value. Specifies the maximum number of features per cluster or the maximum attribute value per cluster. If a maximum constraint is set, the number_of_clusters parameter is disabled. Must be a positive value. The number of clusters to create. When you leave this parameter empty, the tool will evaluate the optimal number of clusters by computing a pseudo F-statistic for clustering solutions with 2 through 30 clusters. This parameter will be disabled if a maximum number of features or maximum attribute value has been set. CONTIGUITY_EDGES_ONLY —Clusters contain contiguous polygon features. Only polygons that share an edge can be part of the same cluster. CONTIGUITY_EDGES_CORNERS — Clusters contain contiguous polygon features. Only polygons that share an edge or a vertex can be part of the same cluster. This is the default for polygon features. TRIMMED_DELAUNAY_TRIANGULATION — Features in the same cluster will have at least one natural neighbor in common with another feature in the cluster. Natural neighbor relationships are based on a trimmed Delaunay Triangulation. Conceptually, Delaunay Triangulation creates a nonoverlapping mesh of triangles from feature centroids. Each feature is a triangle node and nodes that share edges are considered neighbors. 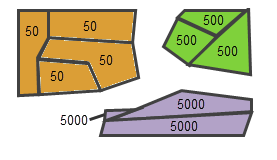 These triangles are then clipped to a convex hull to features cannot be neighbors with any features outside of the convex hull. This is the default for point features. GET_SPATIAL_WEIGHTS_FROM_FILE —Spatial, and optionally temporal, relationships are defined by a specified spatial weights file (.swm). Create the spatial weights matrix using the Generate Spatial Weights Matrix tool or the Generate Network Spatial Weights tool. The path to the spatial weights file is specified by the Weights_Matrix_File parameter. The path to a file containing spatial weights that define spatial, and potentially temporal, relationships among features. The number of random permutations for the calculation of membership stability scores. If 0 is chosen probabilities will not be calculated. Calculating these probabilities uses permutations of random spanning trees and evidence accumulation. This calculation can take a significant time to run for larger datasets. It is recommended that you iterate and find the optimal number of clusters for your analysis first and then calculate probabilities for your analysis in a subsequent run. Setting the Parallel Processing Factor Environment setting to 50 may significantly improve the runtime of the tool. If specified, the table created contains the results of the F statistics calculated to evaluate the optimal number of clusters. The chart created from this table can be accessed by selecting the List By Charts tab in the Contents pane. the following Python window script demonstrates how to use the SpatiallyConstrainedMultivariateClustering tool.